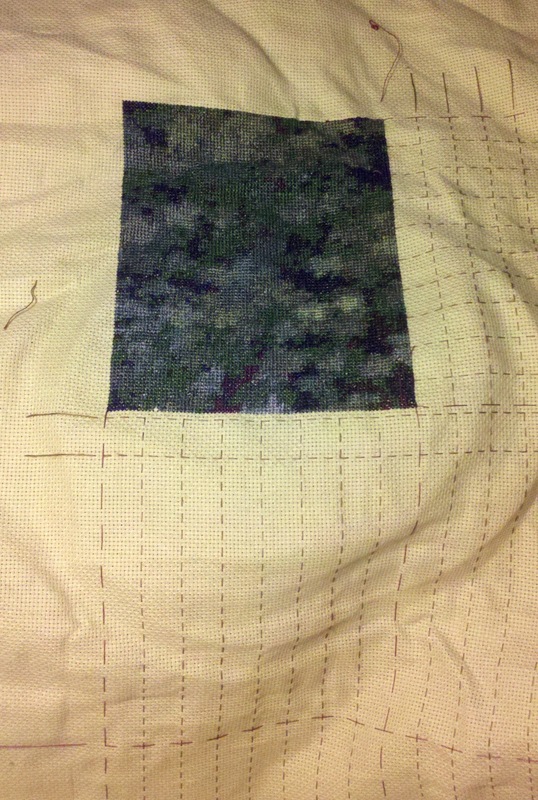 Fabulous Frogger: First HAED page complete! I've finally completed 1 full page of one of my HAED pieces! It still resembles camouflage to me, but when I compare it to the real picture I can see the right images coming through. So excited!! I've never rotated so many projects in one month before....I'm so used to focusing on one piece at a time, but I have so many different things I want to work on!! I've actually enjoyed the rotation, but I'm looking forward to finishing some items and focusing on just 2-3 instead. Another project I've made some headway on is my Cathedral Windows Quilt. 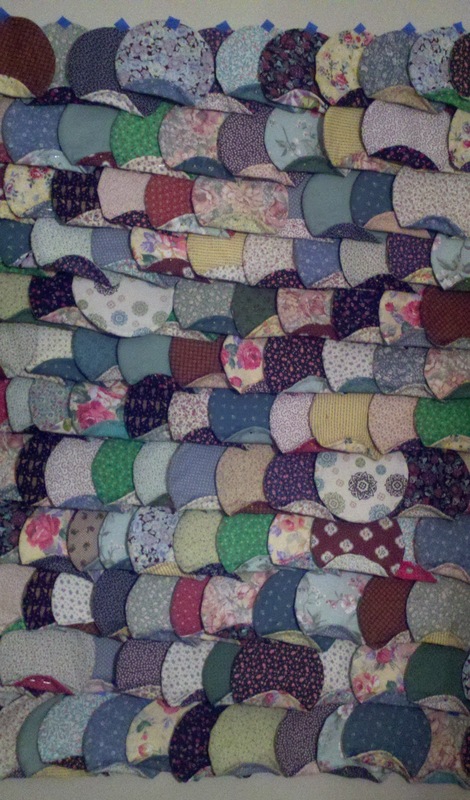 My last update had me with all my circles cut out and ready to sew. I've sewn them all, turned them all out and ironed them. I've finally started sewing them together and hope to have a finish to post soon!! Piles of my completed circles! I taped my circles to my wall to figure out the best patterns to put them in. Was trying to avoid having duplicate material too close together. This took more time than I could have imagined! 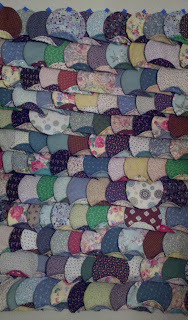 And finally.....some rows of sewn circles! I'll be working on my Blue Moon piece. I haven't touched it since my January WIPocalypse update, so hoping to make a good chunk of progress. I can't believe January only has about a week left! I swear it was just Christmas!!! Work has kept me busy for this new year, so time has just been flying by!! Hopefully things slow down in February and I can visit my blog-world more often. I feel so disconnected from everyone's blogs because I haven't been reading them for a week or so! :( I need to find an hour this weekend and play some catch up. I hope everyone is having a wonderful 2012 so far....I'll catch up on all your blogs this weekend! I'm sorry I've missed out on your updates! 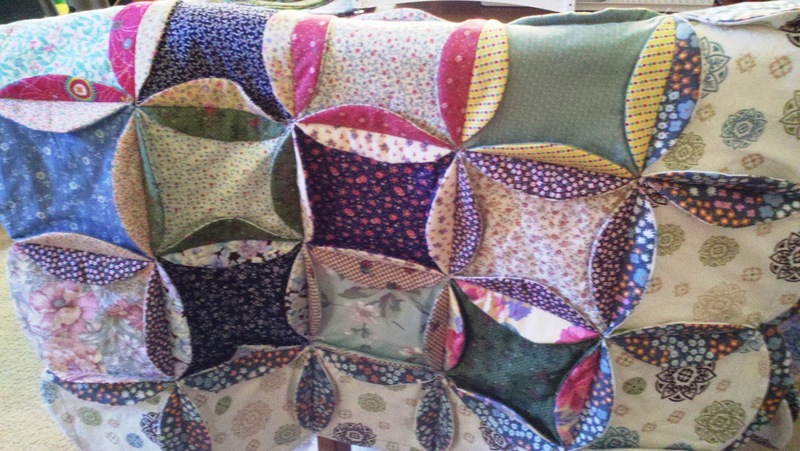 I am loving that quilt! I may have to try making one! I think I'll try to look through my fabrics tonight. 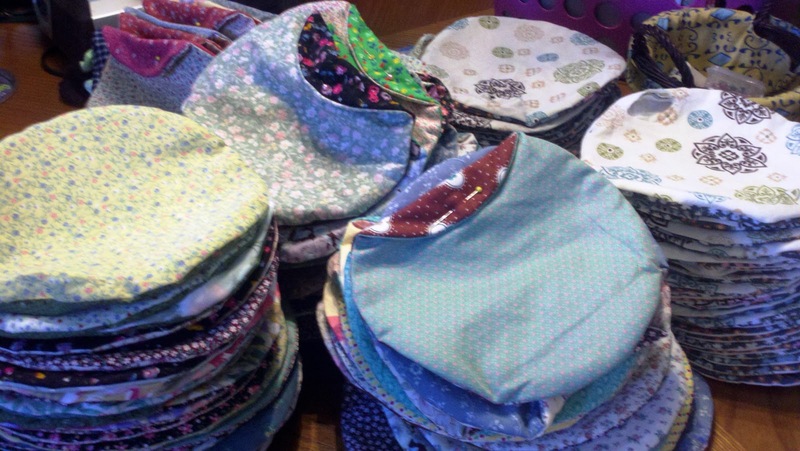 Wow, you have been a busy stitcher...love the progress. And congrats on the weight loss...you should be so proud of yourself...it's a hard walk, I know! Great progress on Cathedral. Look forward to seeing your progress for IHSW. Lovely quilt. Congrats on page 1 of Cathedral. Love the colors in there and your quilt!! WOW!!! Major Congrats on the HAED page. It's beautiful! I agree with you and the camo comment haha. Your quilt is very neat. I've never seen one like that. Good luck with your IHSW. I look forward to seeing how much progress you make. Wow thats amazing how much weight you have lost, good job. And I would have gone blind stitching the Cathedral, so impressive. 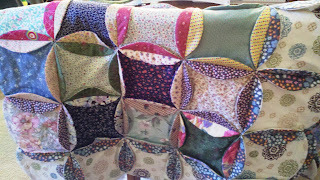 congrats on the HAED finish :D and Lovely quilt. Maybe you should invest in a couple of wrap tops/dresses that can be tightened as you lose the weight a bit easier. Good Luck! Wonderful progress on your haeds. I'm doing Blue Moon as well. Congrats on your weight loss. Looks great, lesli! Congrats on the page finish. Finishing a page of an HAED is like a mini finish in and of itself! Congrats on the weight loss, too! That's so great!